The Design Museum's new home in Kensington is an audacious reworking of the Commonwealth Institute, and marks the start of an exciting new chapter in the museum’s history. As well as creating an engaging space for the museum's displays, architectural firm OMA sought to save the Grade II* listed building, which had stood vacant for over a decade. A centrepiece of the proposals was the retention of the Institute's distinctive parabolic form and copper roof. The refurbished shell and exterior were designed by OMA with Allies and Morrison. Completing this complex project required close co-operation with John Pawson, the museum’s interior architects. Among the large-scale refurbishment objectives were: completely redesign the structure; excavate the basement for increased floor space; and ensure the Design Museums’ future operational needs would be met. Retaining the existing structure's dramatic views was also an essential component of the brief. Engineers Arup and contractors Mace ensured the famous parabolic copper roof was not only kept intact, but kept in-situ throughout the refurbishment. The building’s facades were replaced with a view to meeting current technical building standards. In order to retain the pale-blue glass and fenestration of the original structure, the glazing system was updated – although the old glass panels were refurbished and re-installed. The new design means the museum is largely illuminated by daylight, while offering impressive views from exhibition spaces. A great deal of care, attention and creativity also went into the environment around the museum. Landscape architects West 8 went about researching original features of the old Commonwealth Institute, in the process retaining notable trees on the perimeter of Kensington High Street and Holland Park. 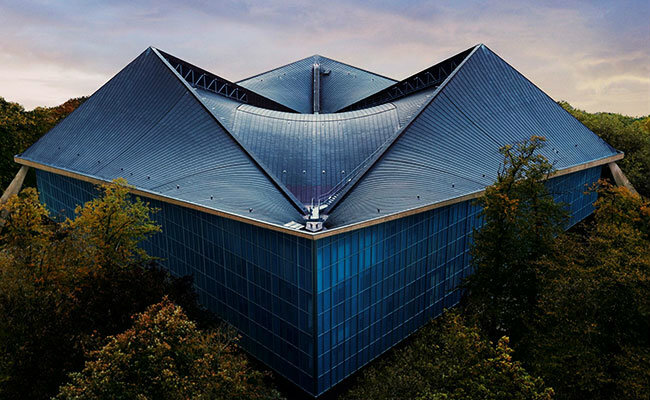 The Design Museum's striking appearance is in keeping with the passion for good design that lies at the heart of the institution. The museum now has the capacity to display even more of the world’s most accomplished product, industrial, graphic, fashion and architectural design; in terms of this latter discipline, the museum’s structure itself is likely to become an admired west London landmark – and will continue the museum's reputation as a mecca for those who love great design. Realising such a project demands the close co-operation of multiple stakeholders, bringing together creative and technical forces in a manner that delivers the client’s vision in full. Here at Inkpen Downie we understand how crucial this harmonious exchange is for completing a structure on time, on budget – and to the highest standards of architectural design. We also appreciate the unique challenges that go hand-in-hand with refurbishing historic and existing buildings, having worked on a number of such projects across the south and east of England. Learn about Inkpen Downie’s architectural and interior design services, and how we go about creating optimum design solutions in large public spaces.